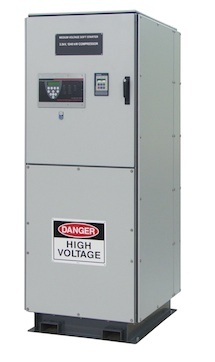 Medium voltage motors (3.3kV, 6.6kV or 11kV) can benefit from soft starting with the TMV range. The benefits that come from eliminating starting transients, reducing locked rotor currents and providing smooth acceleration speak for themselves. The TMV design addresses safety with features that include segregation of circuits and the provision of an isolation and earth switch. A reliable design in a compact enclosure makes this the choice for starting motors in fixed speed applications.